Look at the glowing, pearlescent skies over NASA's Radome at McMurdo Station in Antarctica. 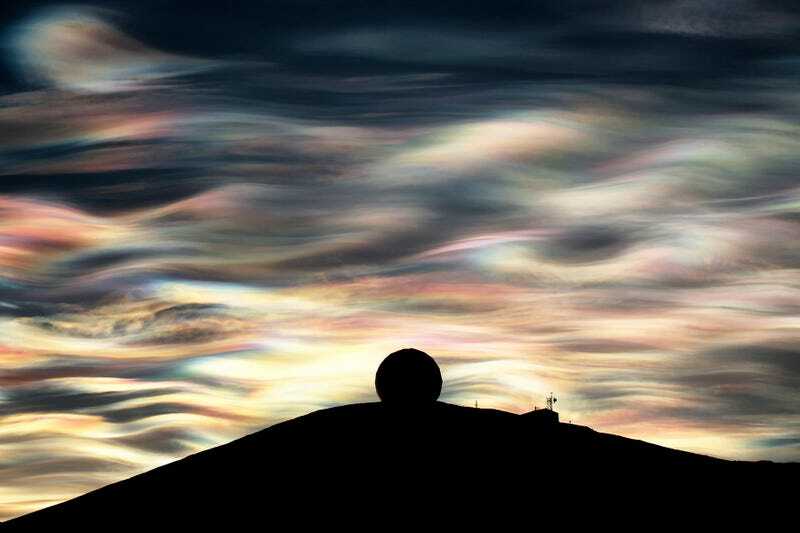 Shot a few days ago by photographer Deven Stross, this image reveals a special property of clouds near the south pole. These nacreous clouds are also called "polar stratospheric clouds" and get their brilliant, rainbow colors from sunlight that's reflected from below the horizon. The clouds are so high — up to 82,000 feet above the Earth — that they continue to glow in these incredible hues long after the sun has gone down. Unfortunately these clouds also contain nitric acid, which reacts with chlorine that's released by industrial processes — and that little combination of chemicals tends to rip ozone to shreds. So this cloud may be beautiful, but it's also destroying the atmosphere. See more of Deven Stross' incredible photography over on his website.